When my new Raspberry Pi B+ arrived yesterday I started wondering about the software implications. 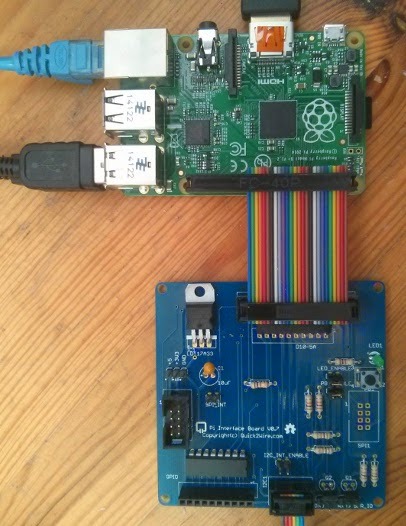 I wanted to verify that the Quick2Wire, Adafruit and Raspi.GPIO libraries work as intended on the new boards, but instead I hit a problem with the new hardware layout. Twenty-six onto forty won't go! I naively imagined that this would mean I could just plug in a 26-way connector onto the correct end of the 40-pin header. It doesn't work, at least with the cables I've tried. The female sockets are so wide that they won't sit down on the 40-way header. You'd have the same problem with the cables supplied with Adafruit's cobbler, as they use standard-width IDC connectors. I thought for a moment that the PiFace might be OK. It's socket is narrower than the standard-with IDC connectors, and it would have sat down fine. Sadly, the new board layout clashes with the PiFace, and I suspect that many other boards won't work either. If I'm right there is going to be a scramble for add-on manufacturers to bring out new 'plus' versions. It's not a (big) problem for the Quick2Wire boards, though, or for the Adafruit Cobbler. As luck would have it I'd decided to order some 40-way connectors at the same time as I ordered the Pi. I already had a 26-way socket and some 26-way ribbon cable in stock, so I quickly built a 26-way to 40-way adapter cable. I can see several other possible solutions. I'll be trying a few more over the next few days, and will report here. Also, it looks as if Adafruit are half a jump jump ahead - they have B+ versions of the cobbler, but they are currently out of stock. I'm delighted with the new board, and I will definitely be using it for C3Pi, using custom connectors. I'm sure we'll see plenty more innovative solutions form the community. Have you hit this problem? Found a good work-around? I'd love to hear. Please let me know in a comment. Arduino e-course is filling up fast!